"Victory can be achieved not in miles but by inches"
1.Begin with an End in Mind. Sometimes in order to succeed in life and also in business, it is imperative that we will have an idea of what we wanted to do and what we wanted to achieve before worrying about the details. Try this. Visualize your successful franchising chain ( let’s say 10 stores operating simultaneously). That is your target. Then from there, work out the details backwards, budget, franchising plans and others. Most of the time it works and it will help you a lot in setting your achievable goal. Visualize your success and follow this popular saying " Don't follow your dreams, chase it!" 2. Social Media Sites Maximum Utilization. The internet is the most valuable information leveler. With the advent of new technology, every businessman is utilizing its power to the helm. With networking sites such as Facebook, Multiply and Twitter, the ones using it to the maximum will be become the leader in the industry. Make a Facebook page for your own business in order to promote your products, new marketing strategies and photos of your business achievements. With over 50 million Facebook users in the Philippines, the opportunities are limitless. 3.Lean and Mean Strategy. Size is power but it does not necessarily mean that those who have bigger organization will become successful. Sometimes the ones having lesser personnel but with good strategies and tactics are going to win in terms of cost benefits. That’s why guerrilla marketing is so popular nowadays because of the techniques it is employing to beat bigger guys in the market. When an organization with lesser personnel moves in the market, it can move swiftly because it will not worry about abundant costs in promoting and operating the business. Keep only key personnel in operating your business. You will save on payroll costs too. 4.Hire the right people the first time around. If you are going to hire people for your organization, hire the right individuals the first time around. Remember that constant personnel turnover is not good for any business. It will have an overall impact in your professional bearing in the industry. Hire the best, the most honest, the most dependable and above the right people. That’s it. No ifs, no buts. Scrutinize their educational and character backgrounds so that you will not fail in getting your desired employee. If you wanted to launch your business into a franchise, contact a professional franchise developer. 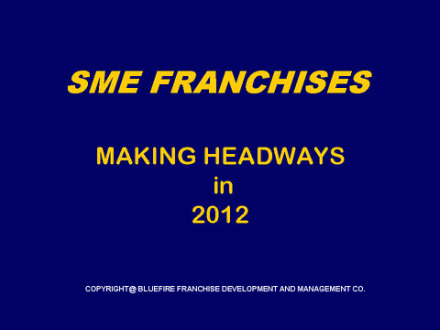 You can visit www.bluefirefranchisedevelopment.weebly.com for more details. 5.Alliances and Partnerships. There is power in numbers as the most famous saying goes. If you are operating a small and medium enterprises, it’s better and helpful to align and partner with associations who can help you in promoting your business and guiding you in turning it around. The intricacies of business can be easily understood with the help of professional contacts and industry friends. 6.Benchmarking with the Pioneer. The first company in the market can teach us plenty of lessons. If you are in the food business, gather information about the best practices of the industry leaders. It can help you a lot in professionalizing the operations of your business. In times of uncertainties, the beacon of light emanates from the first who ventured that particular market segment. 7.Research and Development . Continuous research is one of the key to success of every business. Don’t be contented with your existing operational systems as well as your current products you are offering to your clients. Look for an angle that will enhance the status of your business. The internet and other industry publications can help you in establishing a brand that will stand out in the market. Manualize every aspects of your operations. Everything that is written can never be forgotten and can be reviewed later on for further improvements. This is critical especially if you are operating a franchise business. Operational manuals will be the bible of the franchising aspects of your business. Establishment of a professional accounting system before registering your business is a critical aspect that must be given your attention. Most of the business loses money even before they operate because of severe penalties they are getting from government regulatory authorities for failure to file the necessary forms and compliance documents. 8.Savings is the Key, Cash is still King. It is important that you will monitor every aspects of your operations. You can keep track of everything by creating a daily , weekly, monthly, quarterly and annual matrix that will determine whether you are overspending in some aspects of your operations. Financial dexterity is important. If you can save, then save. When the economy is down and everything is not coming your way, Cash is still king. (Should you want to avail of the services of our company, please email us at bluefirefranchising@yahoo.com or click the SERVICES portion of this website and kindly fill up the booking form). Content provided and Website Design by Bluefire Franchise Development and Management Co.